People who appear to have it all together sitting in cold-hearted judgement of others. People who sniff their disapproval of those with tattoos or nose rings. People who claim they welcome others to their churches — as long as those people fit in, ’cause hey, we’re certainly NOT going to change for YOU. People who seem to spend more time angrily opposing things than lovingly offering an alternative. All this is how I see “religion”. 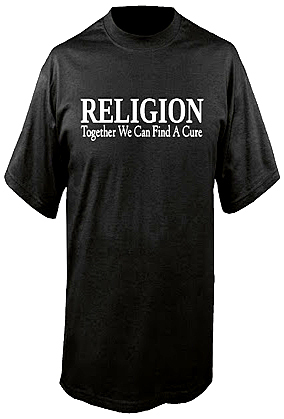 Is there a cure? Absolutely, but it’s controversial. It’s Jesus Christ, whom serious Christian believe is God’s divine Son. Still with me, but wondering what the heck I’m writing about? Good. During His physical time on earth, Jesus had little use for the rituals of “religion” and the self-righteous, soulless lives it so often produces. Exactly. That’s the thing you might not know: Christianity isn’t about a religion. It’s about a person and how you and I can have a relationship with Him that starts in this life and stretches into eternity. That means no guilt-induced rituals that create nothing but spiritual fatigue. It also means thoughtfully, consciously turning away from the elitism of “us versus them” and the smugness of judgmentalism. When people honestly, humbly come to Jesus, they come knowing they are very bit as imperfect as the people they are tempted to judge. They come with the realization that it’s them who must change. That was the case for me when I decided to believe in and follow Jesus at age 42. And it’s made me a better person. Sound interesting? Yes or no, post your thoughts below and let’s have a conversation.